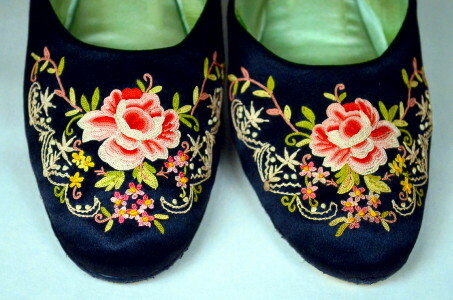 1910's vintage mules/slipper pumps with polychrome embroidery. Black and mint green silk, multicolor embroidery. Scoop throat vamp with fine chain stitch flower motif embroidery. Rounded close toe. Black and mint green lining. 2 inch Louis heel. Very good condition. Shows general wear consistent with age. Moderate wear to soles. Linings well worn. Embroidery and vamp in excellent condition. Would make lovely display piece.